EM Consulting – Our business is developing yours. Building your practice is what we have in mind. Working together we discover your unique brand of lawyering and use this message as the umbrella under which all marketing efforts will fall. The journey of building and enhancing client relationships applies your distinct brand message to your business development strategy, website, social media platforms, content management, and visibility raising campaigns. At EM Consulting our sweet spot is creating a definitive roadmap to get you closer to your clients, marketplace, and referral sources. 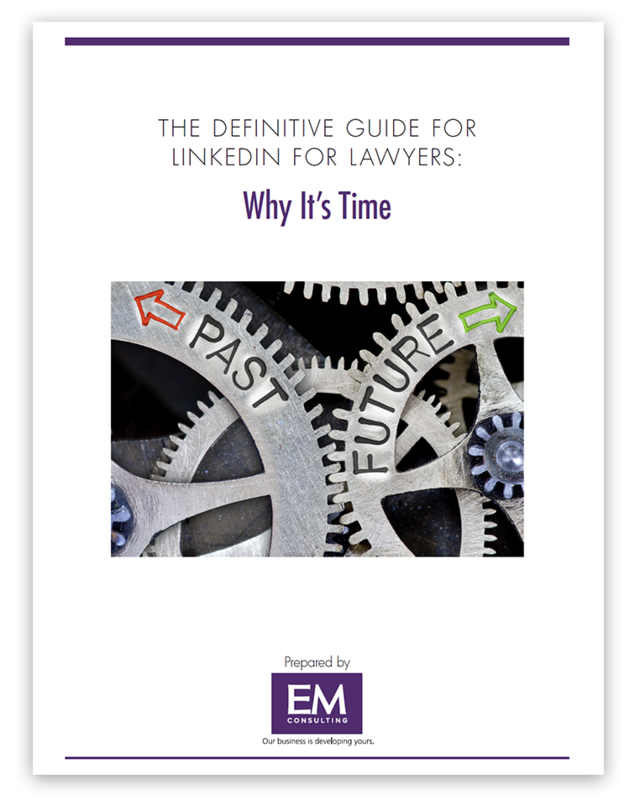 Get "The Definitive Guide for LinkedIn for Lawyers"
Subscribe to our elist and you'll receive this highly informative guide to leveraging LinkedIn for your law firm. After more than 25 years in the professional services marketing business, a person forms an opinion or two. This is extremely true for us at EM Consulting. In our Extremely Opinionated blog, our goal is to share ideas and opinions with you that might stimulate your thinking about marketing and business development. ©2019 EM Consulting. All rights reserved.